Registration will be closed at 11:00, 25 Jan 2019. Those who are not registered may try to walk in on a first-come, first-served basis. We are a well-established group of electrical & mechanical, IT and environmental engineering companies headquartered in Hong Kong with strong presence in Macau and Mainland China. Some of our key business focuses are building services, electrical, environmental, and mechanical engineering. Apart from operating as electrical and mechanical contractors, we are also manufacturers and suppliers of electrical and mechanical equipment. 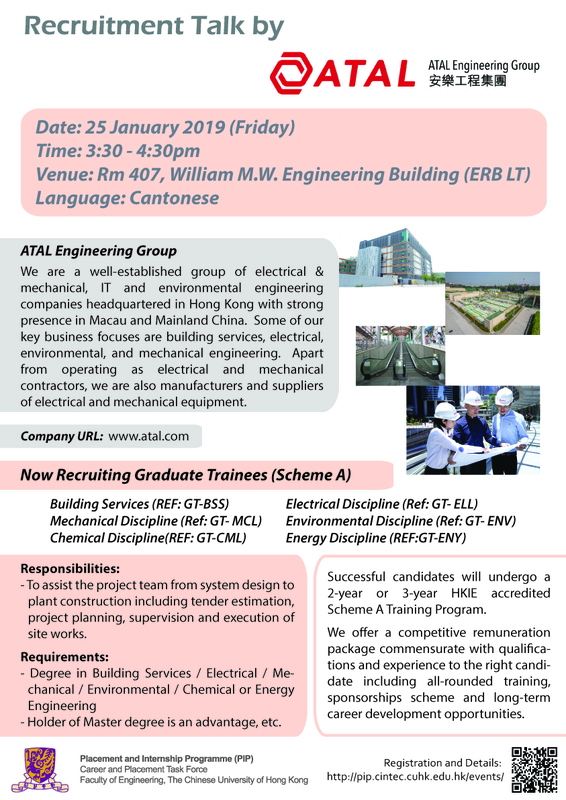 A comprehensive Scheme “A” Training will help you to become a professional engineer and to be the HKIE Corporate Member in a faster route. Join ATAL and explore your potentials. 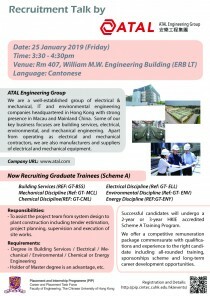 Successful candidates will undergo HKIE accredited Scheme “A” Training Program in Building Services, Electrical, Mechanical, Environmental, Chemical, or Energy Discipline.You will be given the opportunities to assist the project team from system design to project construction including tender estimation, planning, supervision and execution of site works. The position provides all-rounded on-the-job training and coaching, job rotation across different business units (subject to training arrangement), alongside exciting and challenging career development opportunities.